British Prime Minister Theresa May on Tuesday suffered a humiliating defeat over her plan to withdraw Britain from the European Union, thrusting the country further into political chaos with only 10 weeks to go until it is scheduled to leave the bloc, as the New York Times’ Stephen Castle and Ellen Barry report. Dive Deeper: “May's Brexit Deal Stumbles in Parliament. Now She is Fighting to Save Her Government,” by the Atlantic Council’s David Wemer. Somali extremist group al-Shabaab claimed responsibility for a deadly attack and siege at an upscale hotel and office complex in Nairobi popular with tourists, business travelers and local elites, as the WSJ’s Matina Stevis-Gridneff reports. Dive Deeper: “The Evolution of the Salafi-Jihadist Threat,” by CSIS’s Seth Jones. The United States is closely watching Chinese intentions toward Taiwan, concerned that Beijing’s growing military prowess may increase the risk it could one day consider bringing the self-ruled island under its control by force, a U.S. official said on Tuesday, as Reuters’ Phil Stewart reports. Over the last five years giant clam harvesting, dredging, and artificial island building have severely damaged or destroyed over 40,000 acres of coral reefs in the South China Sea. Reefs have been declining by 16 percent per decade. Source: “Illuminating the South China Sea’s Dark Fishing Fleets,” by CSIS’s Greg Poling. 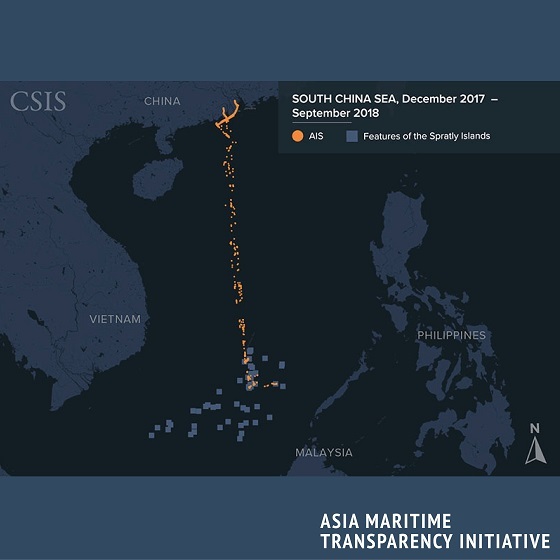 A new interactive report on the South China Seas dark fishing fleets identified China's Yue Tai Yu fleet using Automatic Identification System (AIS) signals. The AIS signals show that, from January to September 2018, these militia ships have operated near Chinese outposts in the Spratlys with no apparent signs of fishing. (Photo credit: Chris Kleponis-Pool/Getty Images). 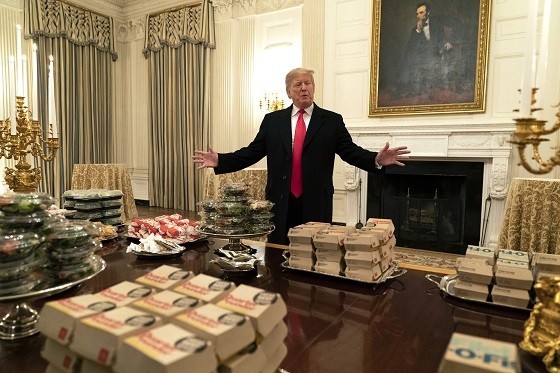 President Donald Trump presents McDonald’s and other fast food to be served to the Clemson Tigers football team yesterday at the White House. “Early Withdrawal Will Lead to More Terrorism,” by CSIS’s Seth Jones and CFR’s Bruce Hoffman. At 10:30 a.m., join CSIS for a discussion on Japan's national defense strategy with H.E. Takeshi Iwaya, Minister of Defense of Japan. Later, at 2:30 p.m., the National Committee on North Korea and NK News will hold a discussion of recent developments inside North and South Korea by Seoul-based foreign correspondents and an assessment of how events may unfold in 2019. And, at 3:30 p.m., the Woodrow Wilson Center will host a conversation with Alex Dehgan about innovative approaches to protecting the environment and advancing security in some of the most politically and ecologically fragile places in the world. Today, CSIS hosted an armchair discussion with Secretary General of the Organization of American States, Luis Almagro about the essential role of the international community in helping to resolve Venezuela’s crisis. Watch the full event here. 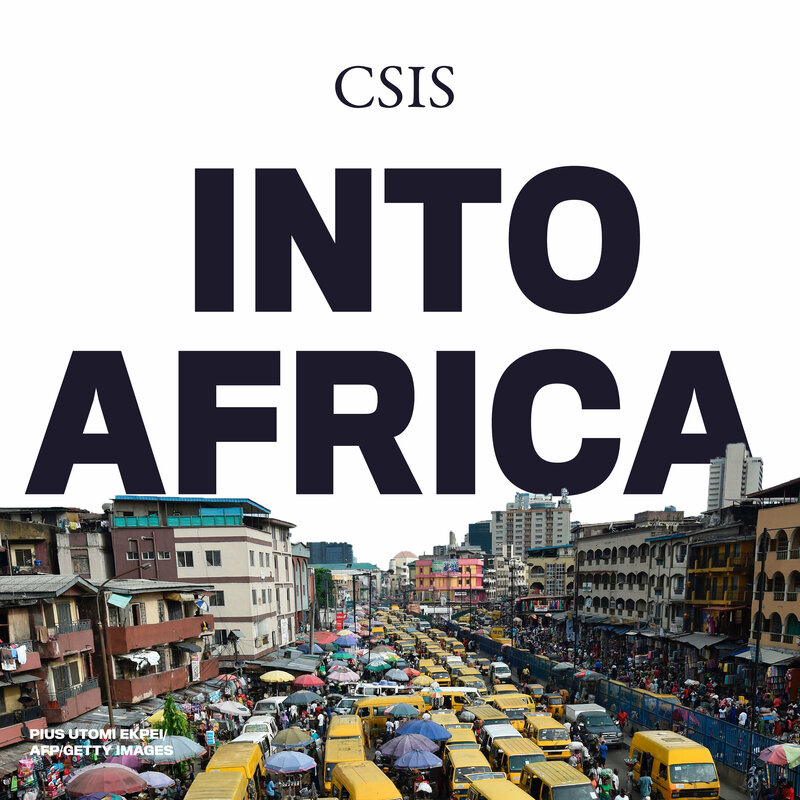 Host Judd Devermont, Africa program director at CSIS, sits down with policymakers, journalists, academics and other trailblazers in African affairs to shine a spotlight on the faces spearheading cultural, political, and economic change on the continent. Carole King is a national treasure. Last weekend she surprised a stunned Broadway audience with a guest appearance marking the 5th anniversary of “Beautiful: The Carole King Musical.” King is one of the most successful songwriters of the latter half of the 20th century in the US, having written or co-written 118 pop hits on the Billboard Hot 100 between 1955 and 1999. Here’s one of those tunes.